The octahedron is one of the Platonic polyhedra. For a discussion of the centrality of the icosahedron in biotensegrity structures, see the discussion under icosahedron . Byron Knight, for example, calls the 3 strut prism an octahedron. The tensegrity structure that outlines an octahedron has 3 struts and 9 tensile vectors. The Simple, Rotated, and Tensegrity Structure Octahedron, from Deployable Antenna Kinematics Using Tensegrity Structure Design By Byron Franklin Knight"
William Brooks Whittier analyzes the same structure, calling it a T-3. It has 3 struts and 9 tensile vectors. This tensegrity structure conforms with an octahedral truss with 12 edges, 8 faces, and 6 vertexes. Whittier notes that this structure fits into both the prism and truss unit cell families. 3 strut 9 tensile vector tensegrity, from Kinematic Analysis of Tensegrity Structures By William Brooks Whittier"
Gómez Jáuregui calls the 6 strut model below an “expanded octahedron.” It is commonly catalogued by other researchers as a tensegrity octahedron. Gómez-Jáuregui photographed a model he constructed from tensegritoy. It is a structure that conforms with a truncated octahedron. 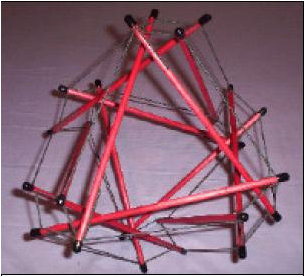 Tensegritoy model that conforms with a truncated octahedron. FromTensegrity Structures by Jáuregui"
Pope describes a tensegrity structure that outlines an octahedron with 3 struts and 12 tensile vectors. 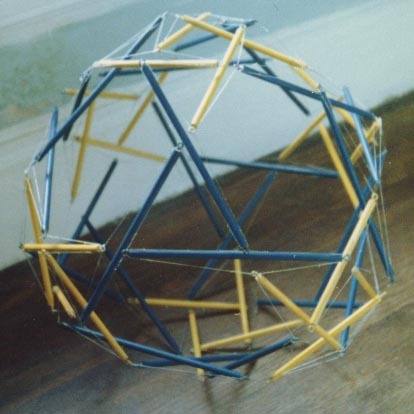 Burkhardt reported in 1983 that his 4ν single layer octahedron formed a dome. He named it a "4ν Octa Aligned Diamond Tensegrity Sphere." The struts were somewhat aligned into lesser circles of six alternating yellow and blue struts, but not as aligned as he had hoped. In general, Burkhardt reported that spherical models are best created based on the icosahedron, since they are formed of networks of alternating triangles. This has its disadvantages since the octahedron has a much more faceted look to it than the icosahedron. An icosahedron would be the preferred basis if it were feasible. This means adjustments must be made in the shape finding procedure so a spherical looking result is obtained. An octahedral basis also yields a lot of member activity at the vertexes. 4ν Octahedron Aligned Diamond Tensegrity Sphere partial by Burkhardt" http://bobwb.tripod.com/synergetics/photos/sltocta.html"
This page was last edited on 27 January 2019, at 12:32.